'Changing Climate: Studying Climate Change in the UC Natural Reserve System,' a video by Nicholas Weiler, UCSC Science Communication Program, 2015. ISEECI was established in 2014 with the support of a $1.9 million grant from the UC President's Research Catalyst Awards program. By bringing together scientists from different campuses, ISEECI has catalyzed new collaborations that have won additional funding from agencies such as the National Science Foundation (NSF). A major new NSF grant, for example is funding research on the interactions between fog, climate change, and redwood forests. Led by Elliott Campbell at UC Merced, the multi-campus, $1.75 million project will provide crucial data supporting the broader goals of ISEECI, Sinervo said. Fog is an important source of summer moisture for coastal redwood forests, but it also interferes with standard methods for studying carbon flow in forests. Campbell's team will use a novel technique involving high-tech laser spectrometers to gather crucial data on redwood tree physiology. Research by Sinervo and others on the animals that live in redwood forests will build on the findings from Campbell's project. 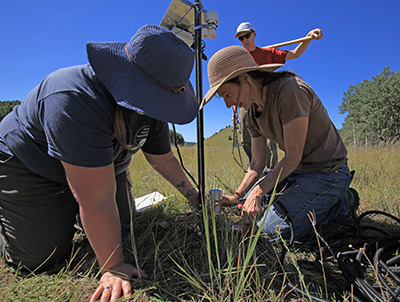 The sensor network being deployed at Big Creek and 11 other reserves is funded by another NSF grant, led by Sinervo and Fox at UCSC and Susan Mazer at UC Santa Barbara. Their collaboration extends beyond the UC reserves to include scientists at the University of Northern Arizona's Southwest Experimental Garden Array (SEGA). Meanwhile, an ongoing project under the ISEECI umbrella is looking at the effects of reduced precipitation in different ecosystems using a standardized protocol for excluding rain and snow from study sites. 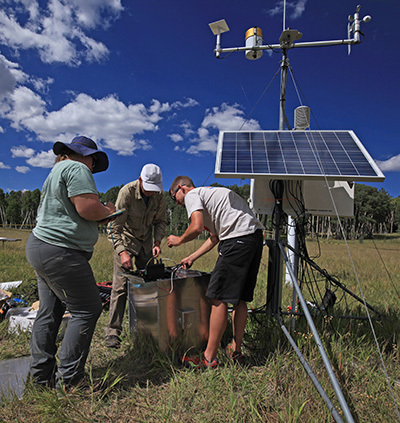 Led by Michael Loik, professor of environmental studies at UCSC, the NRS study sites are part of a larger international network of sites, called Drought-Net, designed to assess the sensitivity of global ecosystems to drought.